Kimchi is one of the new vegan discoveries at Plum on Park in Montclair that is establishing this aubergine eatery as one of the region’s “don’t miss” locations. Often described as “fermented cabbage,” most Americans hesitate trying it before discovering that the national dish of Korea is a tart and spice taste treat with a crunch that is simply addictive. Still scratching your head in befuddlement about “fermented” food? Reality check: nothing is more American than baseball, the kraut on your dog and beer in your pilsner at the stadium are both fermented. So it is not that unusual after all. 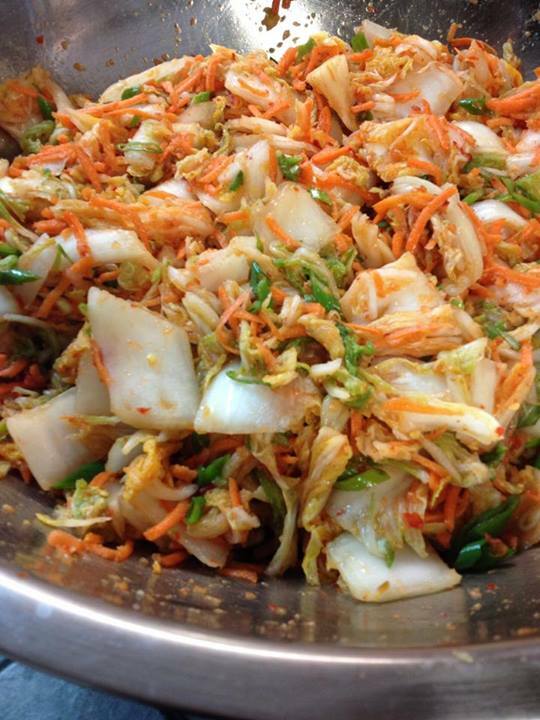 The traditional Kimchi consists of vegetables, usually cabbage but sometimes radish or cucumber, salt, garlic, ginger, spices and fish sauce. Natalie Colledge, the owner of Plum on Park uses the original idea of Kimchi to great a vegan version that has left every customer who has tried it wanting more. Gone is the fish sauce as well as the aroma fish sauce brings to the dish, what’s left is garlic, ginger, onion, pepper flakes and scallions. Collegde uses Bragg’s Liquid Aminos so it is gluten free. Natalie was kind enough to let me try her kimchi, and even better share her recipe! 1. Cut cabbage in half, remove core and cut into bite sized pieces. 2. Wash cut cabbage in a large bowl and drain. 3. Add the salt to cabbage and toss to distribute salt evenly. 4. Let cabbage sit in bowl tossing it every 30 minutes (do this two times). 6. Drain the cabbage well and transfer to a large, clean, non-reactive bowl. 7. Combine water and sweet rice flour and heat, stirring constantly, over medium heat until thickened. 8. Add sugar and stir until sugar is dissolved. Set aside to cool.9. Combine garlic, onion, ginger and hot pepper flakes in a food processor and pulse until finely chopped. 10. Add Rice Flour/Sugar mixture and Bragg’s Liquid Aminos and process until combined into a paste. 11. Add contents of food processor and last two remaining ingredients to drained cabbage and stir gently. 12. Transfer cabbage into a non-reactive container packing it down. 14. After 2 days check kimchee. It should smell slightly sour and you could see bubbles. 15. 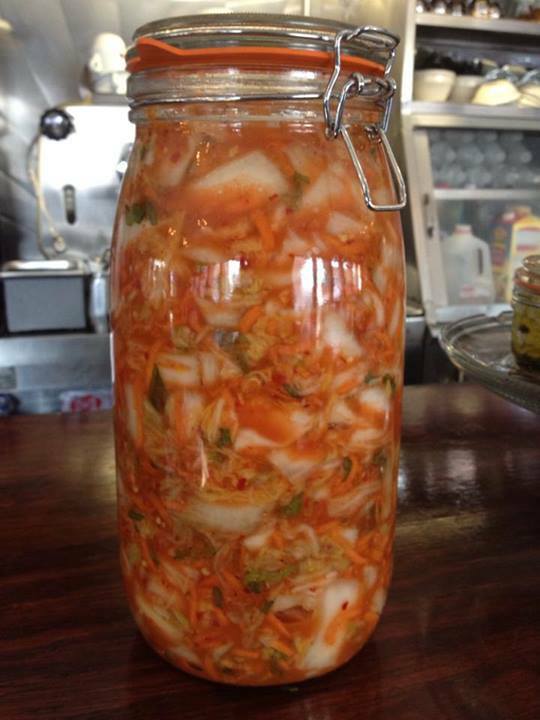 Place kimchee in refrigerator for a few more days until it is to your desired taste. 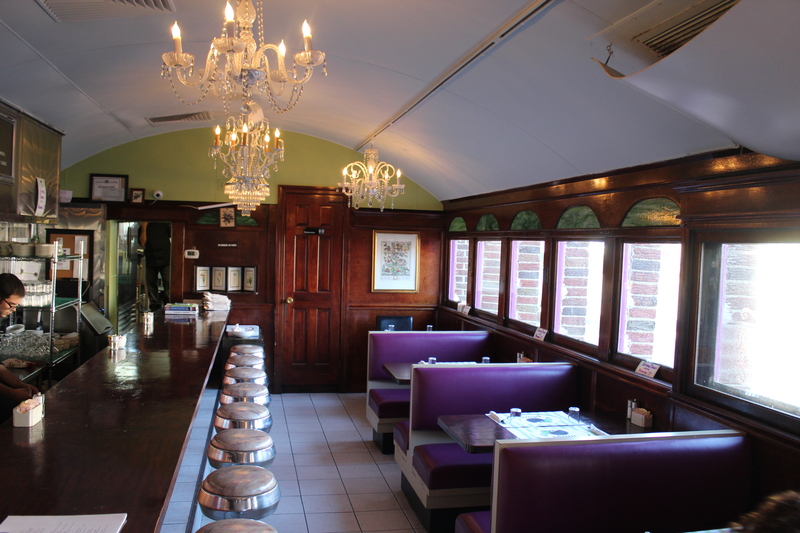 Plum on Park is that cute plum colored eatery that recalls the era of railroad dining cars on Park Street in Montclair NJ. With a soundtrack that rivals WBGO and a changing menu that reflects the chef’s passion and talent, Plum on Park is a favorite hang out for team Black Tie. It is located across the street from Samba, and next to Fricassee, ‘the Plum” is sure to become as much of a local icon as the famous Montclair Rooster.